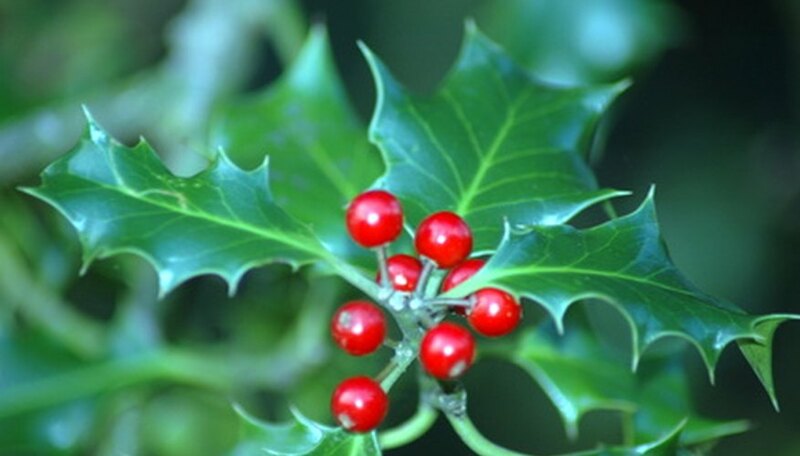 An evergreen that is available as a tree or a shrub, holly (Ilex spp.) makes an attractive landscape plant, with its bluish-green curled, evergreen leaves and red berries that ripen in autumn and persist well into winter. As companions for holly, plant deciduous shrubs with yellow spring flowers or bright red autumn color for interest during these seasons. A summer-flowering ground cover will provide summer interest and help to moderate soil temperatures and conserve soil moisture. Although clematis is primarily a vining plant, the hybrid Clematis x durandii makes an excellent ground cover that is not aggressive. It produces 4 inch blue flowers in summer that are an excellent backdrop for holly. This hybrid clematis prefers partial shade to full sun and will benefit from a mulch to keep its roots cool. Prune it back to ground level in early spring before new growth begins. Clematis x durandii is not bothered by insects or diseases but may be susceptible to wilt. Covered by golden yellow flowers in early spring, the deciduous shrub gold forsythia (Forsythia x intermedia 'Kolgold') is an excellent companion to holly, contrasting nicely with holly's bluish-green leaves. After blooming, 'Kolgold' grows rich green leaves that blend well in the landscape. It will reach about 5 feet tall with a 4 foot spread and prefers to grow in full sun. Forsythia can be planted at the back of the shrub border or as a hedge. It is excellent grown in a low-maintenance shrubbery planting where it can reach its full size and spread without pruning. With its blazing, fiery red autumn foliage, the hybrid burning bush 'Cole's Compact' (Euonymus alatus 'Cole's Compact') is an excellent addition to any grouping of evergreen trees or shrubs. Its red fall color nicely complements the red berries of holly bushes. 'Cole's Compact' burning bush grows about 6 to 8 feet high with an equal spread. It prefers full sun and needs regular watering, particularly during hot summer weather. Spring flowers and fall berries are small and inconspicuous on all varieties of burning bush. It is primarily grown for its fall foliage, as an addition to groupings of shrubbery, or as a border hedge.